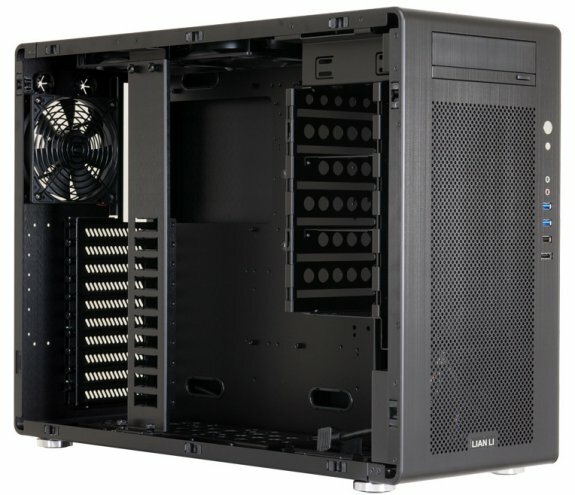 Lian Li delivers the PC-V750, a new case with support for motherboards as large as EATX. 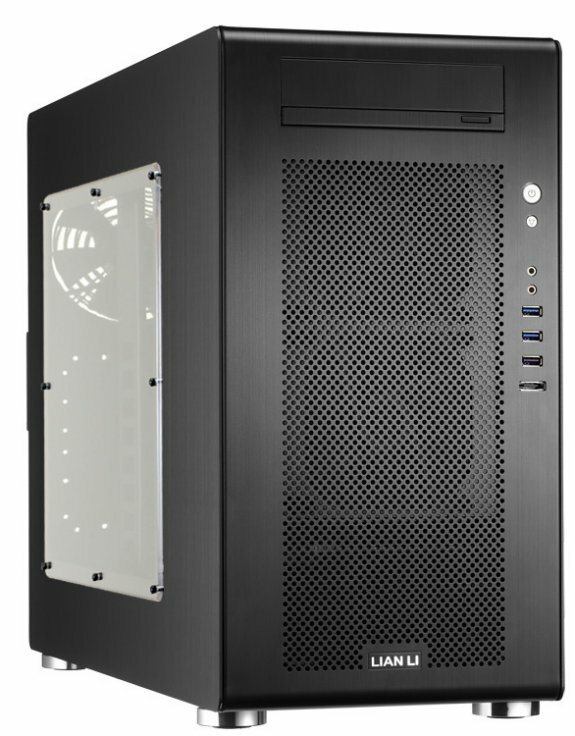 The full-tower case feature pop-off side panels, has five fans and room for ten expansion slots, but contrary to most cases, the PSU is located in the front. The interior is quite roomy and there's support for nine 3.5" HDDs (6x hotswap) and six 2.5" HDDs (3x use 3.5" bay). The front side of the case offers an I/O panel with two USB 3.0 ports, one USB 2.0 port, one esATA port and audio ports. The PC-V750 will ship within a couple of days. The PC-V700A (silver) and PC-V750B (black) will cost $319, while the PC-V750WX all-black model with side window will cost $349. 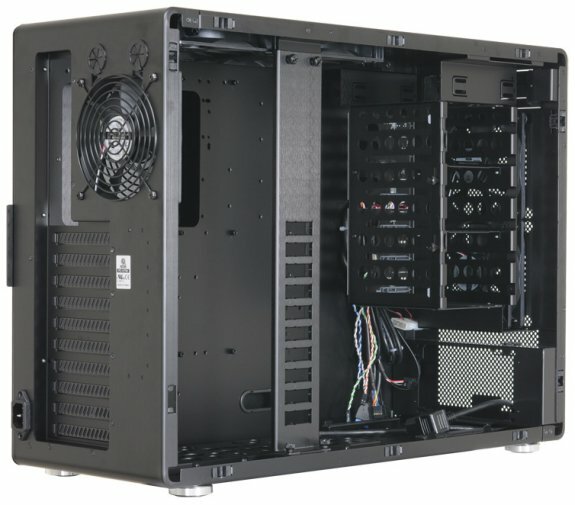 Lian-Li Industrial Co. Ltd, today announces a brushed aluminum EATX supported chassis with a front placed PSU – PC-V750. With the power supply placed in the front, the PC-V750 can hold the hardware that enthusiasts desire while keeping a smaller footprint. Shorter than most EATX supporting chassis, the 440mm (17.32”) tall PC-V750 can hold up to six 3.5” hard drives with hotswap capabilities in the HDD cage with one 2.5” at the bottom of the cage. Two more 2.5” drives can be installed if only four 3.5” drives are in the cage. For users who don't want an optical drive, an additional 3.5” drive can be put in the 5.25” bay. Two more 3.5” or three more 2.5” hard drives can be placed on the floor on the chassis adding even more storage potential. Under the HDD bay a standard ATX power supply can be comfortably placed. A pre-routed cable for the power supply wraps around behind the motherboard tray for plug access in the rear of the chassis. The PC-V750 provides ventilation slits underneath the PSU with a removable pull-out filter to help increase the life and performance of the power supply. The PC-V750 has ten expansion slots for future upgradeability. Graphics cards up to 380mm in length can fit, and an arm helps to support longer cards. Five well-placed fans keep your hardware at optimal operating temperatures. Two front 120mm fans blow cool air directly on the HDD rack. Dual top 120mm and one rear 120mm fans keep the cool air circulating throughout the case by pulling hot air out of the chassis. Additionally, the Lian Li PC-V750 supports water cooling with two rubber grommet holes. On the front I/O panel there are two USB 3.0, one USB 2.0, one e-SATA and HD audio ports providing high connectivity capabilities. Because details are important, this elegant brushed aluminum chassis has many features that DIY builders can appreciate such as easy-to-remove pop-off panels for simple installations and upgrades and sturdy aluminum feet with rubber bottoms to reduce vibrations. The PC-V750 comes in three varieties: silver (PC-V750A), black (PC-V750B), and internal black with a side panel window (PC-V750WX).